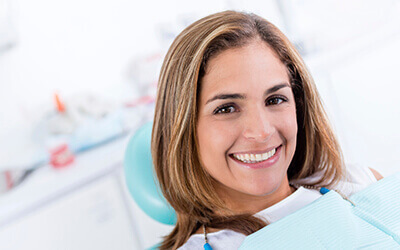 Cosmetic dentistry can be any procedure that improves the appearance of patients’ smiles, and at Tomko Dental Associates, we take the cosmetic effects of every treatment into consideration. If you’re unhappy with any aspect of your smile, our team offers a variety of cosmetic solutions to perfect even the most flawed smiles. Contact our Allentown dental team to find out more or schedule a cosmetic dentistry consultation. We welcome patients from nearby Breinigsville and other communities. 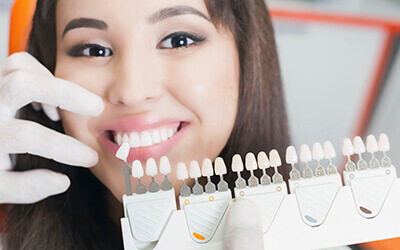 Veneers are thin sheaths of dental porcelain that are attached to the front surfaces of teeth to conceal dental chips, cracks, stains, and gaps. Porcelain veneers allow our team to instantly transform damaged teeth into flawless smiles. Patients interested in veneers should plan to visit our office two times. During an initial appointment, we prepare teeth by removing a small amount of surface enamel. This preparation allows the veneer to lay flat within the natural smile line. Then, we capture bite impressions that are used by our dental lab to craft custom veneers. Before patients leave, we place a temporary veneer to protect the prepared teeth and let patients get used to the look and feel of their veneer. Once we receive the custom porcelain veneer from the dental lab, patients return to our office where we’ll exchange the temporary for the permanent veneer. Metal-free restorations blur the line between cosmetic and restorative treatments. These all ceramic crowns, bridges, inlays, and onlays allow our team to renew the appearance of damaged teeth as well as the form and function of the tooth. Metal-free restorations are crafted from a solid block of high-quality ceramic. These restorations are less likely to chip, crack, or break away from the tooth over time, and even after years of wear, ceramic restorations perfectly match patients’ natural dental structures. Traditionally, we would need to schedule two appointments to complete these restorations, but we also offer same day dental restorations using the CEREC CAD/CAM system. Dental bonding, sometimes referred to as cosmetic bonding or direct bonding, is a treatment that repairs or conceals any number of cosmetic flaws. Using the same tooth-colored composite resin material we use for fillings, we can fill in chips, cracks, and gaps, and conceal stains and other cosmetic flaws. For those patients with minimal damage, dental bonding may be an affordable alternative to porcelain veneers that can be completed in a single visiting. The process is simple. We apply the malleable composite resin material to the tooth, shape it in position, and use a curing light to harden the material. Teeth whitening is one of the most popular cosmetic services. We offer in-practice teeth whitening using the Zoom! system. Zoom! combines the application of high doses of whitening solution and a specialized light that accelerates the whitening process. In-practice whitening is safe and predictable offering results up to ten shades brighter in about an hour. We are also happy to provide at-home whitening to brighten smiles over the course of several weeks of treatment or to touch up in-office treatments. Straighter smiles doesn’t have to mean a mouth full of metal brackets and wires. 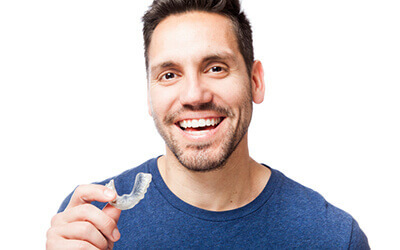 Using the Invisalign clear braces system, we offer patients correction for even advanced alignment concerns, including over, under, and crossbite, using a series of clear, plastic alignment trays. Each set of Invisalign aligners represent a stage in the treatment process one step closer to the patient’s desired alignment. Worn for at least 20 hours each day, these clear aligners gently shift teeth over the course of about twelve months of treatment.